Begin by selecting your original outbound trip from Grand Portage on the mainland and your desired drop off point on the north shore of Isle Royale. 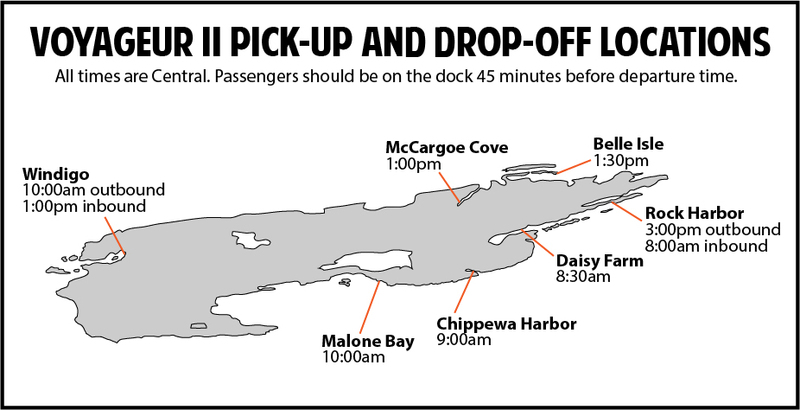 Then select your inbound return trip from a pick up point on the south side of the island back to Grand Portage. You can select interim pick ups and departures as well, from and to any of the same-day stops along our route. When you have added all trip components to your shopping cart click "Check Out" to make a payment and complete your reservation. You will receive an email confirmation for a successful booking. SEA HUNTER III to Windigo only for use only when the Voyageur II is sold out, or on days when the Voyageur II isn't scheduled. Grand Portage (8:30am) For late September trips check your email confirmation for exact departure time. SEA HUNTER III from Windigo only for use only when the Voyageur II is sold out, or on days when the Voyageur II isn't scheduled. Windigo (2:00pm) For late September trips check your email confirmation for exact departure time. will be deemed "No Show" and will forfeit your refund.